Discover the sights of Guangzhou, Hong Kong and Macau on a 6-night tour with 4-star accommodation and several guided tours. Travel by train to Guangzhou and take a guided full-day tour that includes Chen Clan Academy, Sun Yat Sen Memorial Hall, Zhenhai Tower and a dinner cruise on the Pearl River. 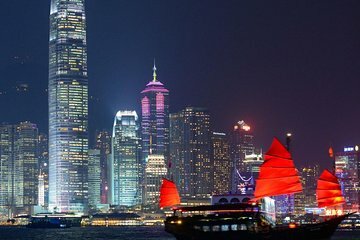 Return to Hong Kong for an evening tour that includes Victoria Peak, dinner at Aberdeen Harbor and Lan Kwai Fong’s night life. Spend a day in Macau seeing World Heritage-listed sites and more. Tour was very well organized and the details and timetable stated in the itinerary was followed promptly. Special thanks to guide in Guangzhou Day 3. The presentation of Guanzhou's highlights - including introduction of the various interesting local lunch dishes - was excellent. Also the sight seeing tour and guide in Macau Day 5 was great. The only thing we missed was seeing Victoria Peak in HongKong as the contents of the Highlight of Night Tour in Hongkong Day 4 was changed after the booking. Visit to Victoria Peak was replaced by ride in Observation Wheel. The ride provided beautiful views of Victoria Harbour at sunset but during the short time in HongKong we actually missed the chance to see the iconic Victoria Peak which we had considered as a must for all visitors in HongKong.